During the past few years the word “worldview” has entered our public space of common discourse as never before. It is not only the intellectual and cultural elites who are talking about worldviews. The concept of worldviews has found its way into the popular cultural as well. Perhaps this is because the world-wide accessibility and influence of radio, TV, movies, videos, music, news, journalism, entertainment, the internet, iphones, laptops, tablets, facebook, twitter and the like have all served to make us radically more aware that we live in a pluralistic society and global age of multiple, competing, autonomous and overlapping worldviews. Worldviews are sets of assumptions, beliefs, values and commitments that we hold, consciously or not, about the nature of reality and the world in which we live. These are ways that we attempt to make sense of and interpret the meaning of what we know and experience. Worldviews have implications for not only what we believe but also how we choose to live. They have implications for how we view ourselves and relate to others in terms of the grand scheme of things. Worldviews attempt to answer such fundamental questions as these: What is the nature of fundamental reality and the world in which we live? What is the relationship between matter and mind? is the physical universe the whole of reality, or are there other non-visible dimensions, levels, or meta-universes? To what extent, if at all, can we know our own nature, origin, purpose and destiny? Is there a god or gods? Can god or the gods be known What does God (or the gods) want? What does life require of us? What is a human being? Are we determined or free, or some combination of both? What can we know? How can we know it? How ought we to live? What is the basis for ethics? What is the good society? What is wrong with the world? Why is there suffering? How do we negotiate such cultural values of individualism and community, competition and cooperation, masculinity and femininity, initiative and receptivity, pride and humility, hierarchy and equality, restraint and expressiveness, certitude and ambiguity, closure and openness, judgment and perception, activism and contemplation, asceticism and hedonism, enterprise and environment, short-term goals and long-term goals? What is our vision for the future? Is there life after death? For what can we strive and hope? One of the major worldview questions involves the “mind-matter problem.” What is the relationship between mind and matter? The worldview of Cartesian substance dualism views these are two realities and offers no attempt to explain if or how they might be related. This is not unlike the Two Kingdom Theory of Christianity, or the Two Realms, spiritual and material, of classical Gnosticism. The worldview of idealism views mind or consciousness as primary and matter as secondary or derivative, an emanation of Eternal or Emergent Spirit, or else an illusion. The worldview of materialism or physicalism views matter as primary and mind as secondary, a surface phenomenon that can be explained, without remainder, in terms of mathematical, physical, bio-chemical, neurological and physiological phenomena. The worldview of panpsychism or panexperiential (the Whiteheadian process philosophy version) views mind and matter as two distinct but inseparable aspects of a single reality (dual aspect monism) that goes all the way down to the quantum sub-atomic world, and all the way out to the entire cosmos. Panpsychists “agree to disagree” among themselves as to precisely when and where indeterminacy, freedom, experience, sentience, consciousness, subjectivity and intersubjectivity come “on line” as we work our way up the physical and biological chain of increased awareness and complexity. Some believe a rudimentary form of awareness, sentience and consciousness is operating even at the cellular and molecular levels. Others think awareness, sentience and consciousness require a central nervous system and a brain. But what they all have in common is the view that matter influences mind and mind influences matter because in a fundamental way there were never separated to begin with. Panpsychists refuse to separate mind and matter as dualists do. They refuse to assign ontological priority to mind, as idealists do. And they refuse to assign existential priority to matter, as materialists do. Religious dogmatists and secular ideologues on all sides will be unhappy with this agnostic and ambiguous stance since it regards the question of the fundamental nature of reality and the relation between mind and matter as one that probably cannot be conclusively decided, whether by various appeals to reason, evidence, intuition, experience, tradition and authority. Some individuals have a split-level worldview. On the upper level they reserve a generous space for the ultimate, the infinite, the mysterious, the unknown, the unseizable. They may call this Mystery by various names, such as God, the Godhead, Being, the Absolute, the Unnamable Tao, the Source, the X Factor, the Meta-Verse, and in so doing may inadvertently slip back into the language of dualism, idealism, materialism or panpsychism. On the lower level such persons posit and defend one of the worldviews with which they feel the greatest affinity, were it to come down to a choice. Such persons will indeed make their appeals to reason, evidence, intuition, experience, common sense, exemplars, tradition and authority in support of their worldview assumptions, beliefs, values and commitments, but they will reserve to take the conversation “upstairs” into the realm of Ineffable Mystery. Or they may claim that introspective intuition and spiritual experience (whether shamanic, numinous, prophetic or mystical) give them “direct or mediated access” to a Transcendental Reality beyond words that philosophical reason and empirical science are not adequately equipped to handle without going outside the boundaries of their legitimate circumscribed disciplinary and epistemological domains. Still others will view any shift from the lower level of presumed knowledge about the fundamental nature of reality to the upper level of Ineffable Mystery as a cop-out, a failure of nerve, a retreat into obscurity. But for those who at home with a split-level worldview that combines a qualified claim to knowledge with as humble admission of Mystery, such an approach is the only way to do justice to our need for convictions on the one hand with our recognition of human finitude on the other. For those who have embraced the modernist assumption that questions about the fundamental nature of reality can be answered conclusively by appeals to “objective” critical reason and empirical scientific experiements, the entire quest ends like a bad dream. Appeals to the full repetoire of rhetorical persuasion techniques, along with appeals to relativity theory, evolutionary theory, quantum theory, systems theory, chaos theory, last man theory, and so forth, can and have been employed in the service of competing worldviews. All one can do is strongly object that others are interpreting and applying a given theory incorrectly. But what this really means is that one is employing a theory in the service of a different worldview or organizing paradigm. Not only are all worldviews “theory-laden,” but all theories are “metaphor-laden.” For this reason the objection that one is interpretating and applying a theory incorrectly may come down to the claim that another is using a shared metaphor in the service of a different interpretive meaning. Because metaphors go “all the way down” in turns of the roots of language and symbolic communication, it may be almost impossible to say who is using a given metaphor correctly and incorrectly. When it comes to the polysemic use of metaphors and analogies, “correctness” and “incorrectness” may be in the eye of the beholder. Moreover, it may be more helpful to speak of the fundamental reality through employing multiple metaphors and analogies rather than becoming married to any one of them exclusively, and reifying it into a form of covert metaphysics. Materialists prefer to speak metaphorically of fundamental reality as a Great Machine or an incredibly complex Computer. Idealists prefer to speak metaphorically of fundamental reality as a Great Mind, a Universal Consciousness, an Akashic Field, a World Soul. Dualists prefer to speak of it as Two Kingdoms, Two Realms that co-exist without intersecting, except perhaps for rare and occasional moments of mystical epiphany, divine incarnation, eschatological revelation or miraculous intervention. Panpsychists prefer to speak metaphorically of fundamental reality as a Head and Body that are distinct yet inseparable since each requires the other to live. Perennial Traditionalists prefer to speak of fundamental reality as Eternal Being and Timeless Essence, the Transpersonal Absolute, the One without a Second. Process thinkers prefer to speak of fundamental reality as Creative Process, Dynamic Systems, the Teleological Imparative, the Lure of the New. All of these worldview ways of speaking about the nature of fundamental reality use metaphors that their more zealous and sectarian devotees have forgotten are metaphors, having conflated metaphors with metaphysics. This applies even to materialists who insist that they have no metaphysics. When metaphors are absolutized and made exclusive through what Whitehead called the fallacy of misplaced concreteness, they take on the force of metaphysical dogma to be militantly defended against the threat of other metaphors. On the practical level what is the challenge of living in a pluralist society and global age of multiple worldviews, belief systems and ways of life? It may mean that we need to learn some new skills, like how to live in “the middle way” between the extremes of dogmatic absolutism on the one hand and relativistic nihilism on the other. It may mean that we learn to live with the search for pluralistic integration on the one hand and the realism of incommensurable perspectives on the other. It may mean that we continue the quest for knowledge, understanding, insight and wisdom, and that we practice the discipline of “epistemological humility” by making room for Wonder and Mystery along side our pursuit of Meaning and Mastery. Call it “Crazy Wisdom,” but we must learn how to integrate the many polarities of our astonishing and bewildering existence into a creative paradoxical whole. 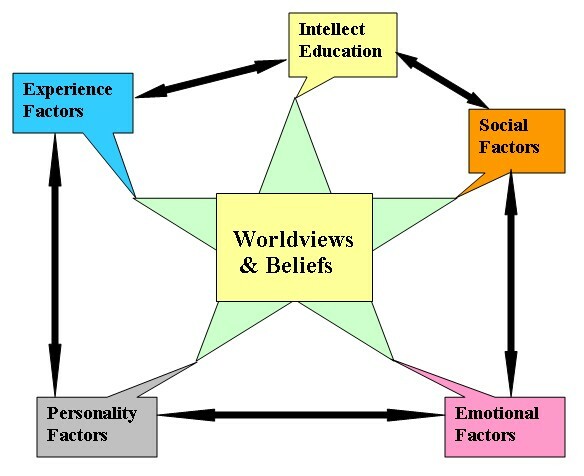 It needs to be said that there are many factors that influence the formation and development of a worldview. The chart below highlights some of these important factors. Intellect, knowledge and education may play a part, but only a part. Often a greater role of influence is played by the other factors, including experience factors, psychological factors, emotional factors and social factors. As we enter into conversation with others, it is illuminating to explore how each of us has been influenced not only by our assumptions, beliefs, values and commitments, but also by our formative life experiences, psychological temperament, emotional responses and social relationships. We do not “think” merely as disembodied free-floating minds or as one-sided rational-analytical left brains but with our whole brains and our whole bodies within a complex and changing environment. Our entire somatic, sexual, emotional, social, mythic, imaginative, volitional, ethical, intuitive and spiritual self needs to be consulted as we weigh and consider, dialogue and discuss the meaning and value of our personal experiences and the dynamically fluid phenomena of our natural, historical, cultural and social environment. Worldviews also include multiple dimensions. In his book, Worldviews, Ninian Smart explores the experiential, mythic, doctrinal, ethical, ritual and social dimensions. For different individuals and worldview communities these various dimensions will be given relatively different levels of importance. Consequently, when persons who live in different worldview traditions and hermeneutical communities come together in dialogue, they may wrongly assume that their dialogue partner ranks the various worldview dimensions in the same order of importance as they do. We need to listen deeply to others if we are to understand not only what they believe and value, but which worldview dimensions are of greatest importance to them, and why. Otherwise, it is likely that we will only end up talking past each other and miss out on the opportunity for creative dialogue as a transformative encounter.